British made binoculars from the 1950s and 1960s are the best kept vintage secret. At the time firms such as Ross, Barr & Stroud and Wray struggled to compete against German and Japanese imports. They turned out well-made binoculars which were just too expensive in the highly competitive market. Today, collectors focus on military binoculars or German made Zeiss binoculars. British made civilian binoculars from this era are largely ignored. Most benefit from coated lenses, a significant advance over pre-war glasses, and can offer top quality optics at bargain basement prices. Bird watchers and amateur astronomers are starting to realise this and forums are beginning to buzz with questions about Ross Stepruvas or Barr & Stroud CF18s. Grab yourself a bargain now, whilst they are still cheap! In the war years, UK binocular manufacturers concentrated exclusively on making military equipment. After the war they quickly switched back to civilian production. Most produced slightly updated version of pre-war models. At the time, British made binoculars were an important part of our export drive and a Barr & Stroud binocular, the CF18, was chosen for the Britain Can Make It Exhibition in 1946. Unlike other exhibits, the Barr & Stroud binocular was by no means a new product. The company first introduced the design in 1929. In the late 1940s British manufacturers enjoyed a modest boom as other countries, particularly their main competitors in Germany, were not in a fit state to market products effectively. The market-leading German firm of Zeiss found itself on the wrong side of the Iron Curtain. However, American soldiers helped some Zeiss personnel to escape to the West before the new boundaries were drawn and two rival Ziess firms set up in business, one in the GDR and one in West Germany. The British firms, Ross, Wray, Barr & Stroud and Kershaw concentrated, as they always had, on the top end of the market, producing high quality binoculars with prices to match. They did little to push home their advantage over Zeiss and for the most part continued with pre-war designs. One modification they did make was to upgrade old designs with coated lenses. This was a Zeiss invention from 1939. It reduced unwanted reflection in the binocular and allowed the maximum amount of light to reach the eye. In the 1950s and into the early 1960s binoculars were an exclusive and expensive product. In the 1960s only 0.2% of families had a pair (1). Whilst 20% of families had cameras, 20% had telephones and more than 75% had televisions. There were some attempts to widen ownership by British firms. Both Ross and Wray launched cheaper ranges in 1957, the Ross Solaross and the Wray Wrayvu. Both ranges started at around £20. Before then you needed to pay much more for entry level binoculars by the top UK firms. Both Ross and Wray benefited from these new models and saw sales and profits rise. There was clearly a demand for cheaper glasses. In the 1950s and early 1960s this demand was met by French imports and by MOD surplus binoculars. The Consumer's Association Magazine, Which?, reviewed binoculars twice in the 1960s; in 1960 and again in 1969. In both reports they concluded that quality was proportional to price. British manufacturers were getting the quality right. Which?, never made allowances for home produced products, but praised the Wrayvu and Solaross in 1960 and gave the Barr & Stroud CF18 and CF24 binoculars best buy status in the most expensive category £35 to £50. However, the sweet spot in the market was at the £20 level. With the growth in leisure and foreign travel, more and more people wanted binoculars, but could not afford British products. What the UK market wanted was slightly lower quality optics for a much cheaper price. In 1965 British consumers got their chance when the UK Government lifted restrictions on the import of Japanese binoculars. The Japanese binocular industry had risen from nothing in 1945 to a world class standard by 1965. The Germans had been less worried about Japanese imports, but by 1963, 82% of all binoculars sold in West Germany were made in Japan. UK makers did not stand a chance. Japanese made glasses were good quality. The Japanese Government carefully controlled the quality of exported goods and only those which earned the 'J' symbol of quality were allowed to export. A favourable exchange rate also helped. 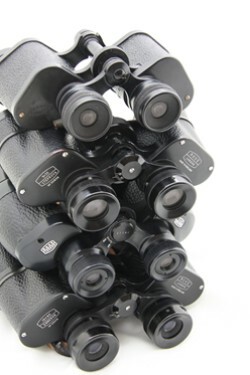 Initially Japanese binoculars were sold anonymously as 'Binoculars from Japan'. You could get an 8x40 binocular made by a good Japanese maker for £17 17 6d in 1966. No quality UK glasses were anywhere near this price. By the end of the decade names like Swift, Asahi Pentax, Canon, Yashica and Tasco were well known to British consumers. One by one British manufacturers went out of business. Barr & Stroud ceased the manufacture of binoculars in 1971, preferring to concentrate on defence contracts, Wray also bowed out in 1971. Ross soldiered on until 1975, when the factory in Clapham finally closed. The main reason why British manufacturers did not succeed was that they failed to provide the quality the market wanted at the price it wanted to pay. This does not mean that they did not make not excellent binoculars. Today you can buy vintage British binoculars from the 1950s and 1960s at rock bottom prices. There is little interest from collectors, but bird watchers and amateur astronomers have already realised the potential of British made binoculars from this era. If you are after top quality optics at reasonable prices then search for Ross, Wray, Kershaw and Barr & Stroud products on eBay. You might still find them going for just a few pounds at a car boot sale or charity shop. Ross, based in Clapham closed 1975 - see guide to Ross models and Ross Solaross range. Source: Which? published 5 June 1969 and contemporary advertisements. Many of these faults are listed by eBay sellers; I would avoid these and look for binoculars with no faults. These faults will be expensive or impossible to fix, unless you are an expert. One very sad reason for our binoculars makers vanishing is they were sold and asset stripped. Thanks for your comment. I agree with you about the British binocular industry. A strong case in point is the Barr & Stroud CF18 pictured above. It was displayed the Britain Can Make It exhibition in 1946, but the design dated to before the War and it was still being sold in 1969. West German Zeiss on the other hand were innovating and were able to charge premium prices. "very interesting articel. I think most international binocular collectors know about this history. on the other hand, finding an good one for example 7x50 with low price - Brands like Zeiss sell all the time in the after/antique market very expensive... just the name..(for example Hartman Wetzlar made better binos than zeiss, closed also in 80s. same problem. cheap japanise against the top brands, no position inbetween..) ok: its very difficult to get further informations about british,(also for exampel russian, they had similar problems, when military market crashed) manufacturers and the performance. just a buyer, not collector, thanks for information! 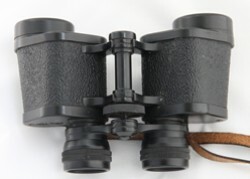 still looking on ebay...now more interested in british brands..
"Hi, I have a pair of 10x50 TERRY BIGMORE MIDGLAM binoculars, very good optics, do you know of them? "Always interesting to read anything about the history and development of binocular industry- times change and unfortunately takes victims. BUT recognition of the British high standard of manufacture has, I believe, led a vastly increased interest both by collectors and continued users of home grown vintage and military sets. Just look at the current prices being paid, and is it just coincidence that so many of grandads and parents old bins are being discovered and sold on various internet sights? I have a proud passion for anything Barr and Stroud, Kershaw and Ross closely followed by USA military, relatively simple to understand and do a DIY clean- if not talk to Tony Kay of Kay Optical or Joe at Viking optical Limited. Invest in. Piece of usable history!! "Hi I have a pair of ross London 9x35 binoculars. Mine have Lancaster writte underneath the 9x35 but look very much like the solaross. I can find very little mention of these anywhere. The number on the plate between the eye pieces, which I assume is the serial number, is 11574. Any information on them would be greatly appreciated. "Curry & Paxton was an optician. In the 1960s they supplied Michael Caine with his iconic glasses. However, the binoculars were probably manufactured by someone else. A pair came up on eBay and they were made in Japan. They only sold for £13. "A very well written article. I have just bought a pair of AOCo 8x30 Jupiter binoculars with coated optics and 8 degree field of view, complete with leather case. 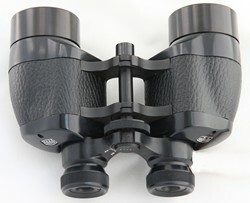 Serial number 167603.They are a superb pair of bins, with perfect collimation and crystal clear, clean optics.